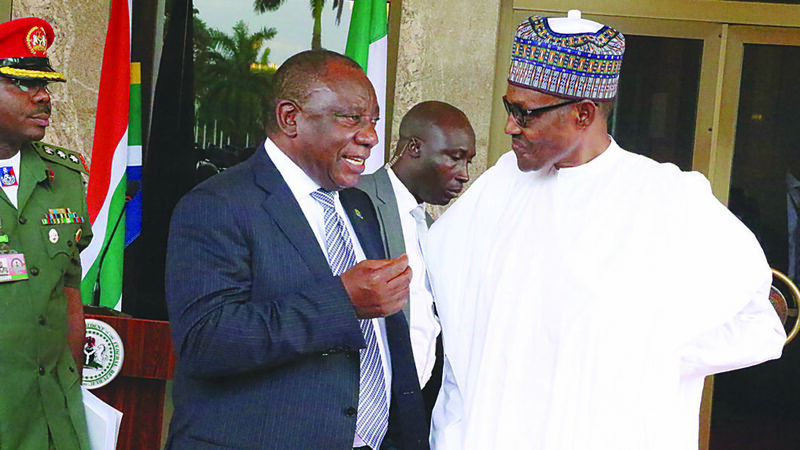 Visiting South African President, Cyril Ramaphosa yesterday met his Nigerian counterpart, Muhammadu Buhari behind closed doors at the presidential villa, Abuja. A report by the News Agency of Nigeria (NAN) indicated that President Buhari received the visiting South African leader at the fore court of Aso Rock about 3pm. It was learnt that the two African leaders would discuss issues of mutual interest to both countries, particularly security and economic matters. The Presidency had on July 8, 2018 raised alarm over the increasing killings of Nigerians in South Africa over very flimsy reasons. Senior Special Assistant to the President on Foreign Affairs and the Diaspora, Mrs. Abike Dabiri-Erewa, expressed displeasure over the killings. Dabiri-Erewa, who reacted to the recent killing of a Nigerian citizen, Ozumba Tochukwu-Lawrence in South Africa on July 6, said no fewer than 117 Nigerians had been killed in South Africa between 2016 and 2018. MTN, a South African based telecommunications company, is currently facing challenges with the Nigeria Labour Congress (NLC) over draconian labour practices and sundry other issues. Ramaphosa would be a Special Guest at the ongoing 25th General Meeting of the African-Export-Import Bank (Afreximbank) in Abuja. Meanwhile, Minister of the Federal Capital Territory (FCT), Muhammed Musa Bello, yesterday conferred an honorary citizenship of Abuja on Ramaphosa, who is on a working visit to Nigeria to explore new areas of mutual cooperation. He was received at the Nnamdi Azikiwe International Airport (NAIA) by Nigeria’s Foreign Affairs Minister, Geoffrey Onyeama. Acting South African High Commissioner to Nigeria, Bobby Moroe, expressed gratitude to the Federal Government and people of Nigeria for their brotherly support in its recent election into the United Nations (UN) Security Council. He underscored the robust relationship between Nigeria and South Africa stressing that both countries were in sync in the current demand for the reform of global governance institutions, particularly reform of the UN Security Council. He stated that Ramaphosa was in Nigeria on the invitation of President Buhari and expressed hope that the visit would also afford the countries the opportunity to look at a mutually acceptable date for their Bi-national Commission and Buhari’s state visit to South Africa.